The purpose of the workshop is to highlight the beautiful books in the kit, to suggest teaching ideas for using the materials in class, and to address some of the concerns that are often raised in terms of engaging in LGBTQ conversations in school. The Stories on the Road website was created to further support the use of the books and materials in the Family Diversity Kit. On the site, you will find lesson ideas, curriculum connections, the complete book list and wonderful web resources. Kits may be requested by emailing Susan Watt. To read reviews of some of the new books that are we are adding to our Equity Committee book kits, please visit our NEW ~ Equity Book Blog. 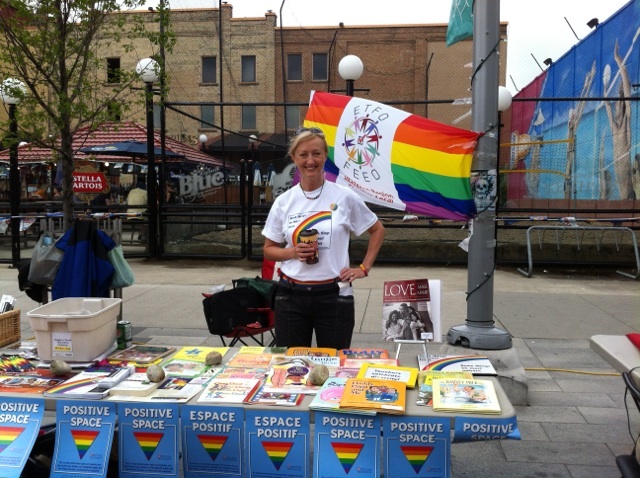 Here I am working at the ETFO table at the 2013 tri-Pride Festival in downtown Kitchener.